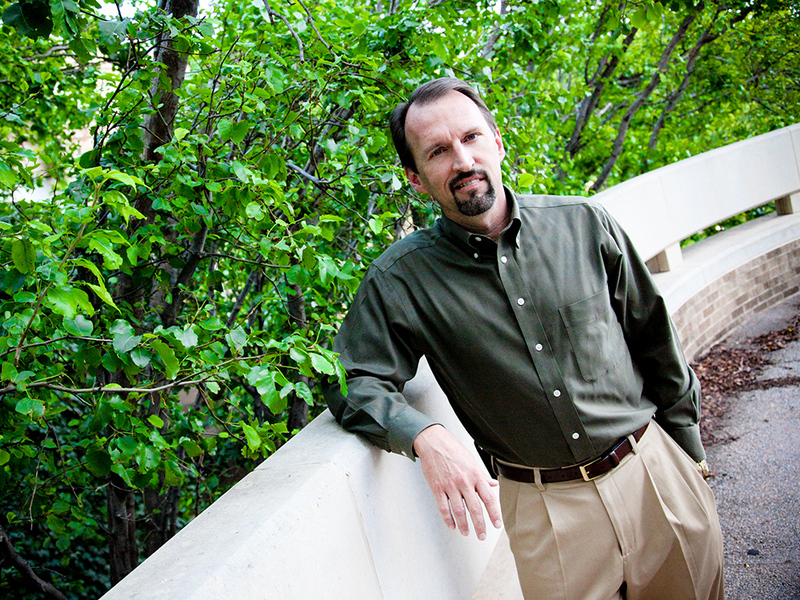 Robert Oglesby is director of ACU's Center for Youth and Family Ministry. Robert Oglesby (’81) likes viewing life from the seat of a fast moving Harley or atop a 14,000-foot mountain peak. He likes taking risks. And that makes him a perfect fit with his chosen avocation – youth ministry. Mentoring, guiding and developing young people is definitely a high-risk undertaking, but one that Oglesby is so good at that he helps youth ministers across the country become the best they can be. Oglesby is director of ACU’s Center for Youth and Family Ministry, located within the Department of Bible, Missions and Ministry. But he’s no ivory tower academic type who cloisters himself in his office all day. His motorcycle helmet is never too far away. Neither is the call to youth ministry. Although Oglesby is on the staff full time at ACU, both as director of the center and as a teacher of youth and family ministry and general ministry courses, he still has his hand in youth ministry. In the summer of 2008, he jumped in at his home church, Southern Hills Church of Christ, while the full-time youth minister was on leave. It wasn’t too big a leap because Oglesby was full-time youth and family minister at the church from 1984 to 1999, when he came to ACU full time. But it did take his full attention – something he was glad to donate to his passion. “I’m one of those professors who loves to do youth ministry,” he said. Since taking on the mantle of director of the Center for Youth and Family Ministry, Oglesby has gained the attention and respect of youth ministers nationwide. And, he’s trained a lot of them – more than 600 in the past 15 years. That volume alone points to the success of Oglesby and the Center for Youth and Family Ministry. Graduates who leave ACU with a desire to become youth ministers are well on their way before leaving campus. In fact, Oglesby meets with a small group every two weeks to help students and alumni find church positions. “Our kids get great jobs,” he said. One who will vouch for that is Matt Wallace (’00), one of the leaders of Dry Bones, a ministry for homeless youth and young adults in Denver. Matt was in Oglesby’s youth classes at Southern Hills from sixth grade through high school and then had him as a professor. Matt remembers that early on Oglesby got the youngsters out of their comfort zones and into unknown worlds – sometimes right around them and sometimes far from home. Oglesby also introduced the students to his own idea of fun – backpacking, climbing mountains, river rafting and hanging out with gang members. “He would dupe our parents into letting us go anywhere with him,” Matt joked. After several years of tasting all kinds of new adventures – from mountain climbing to sometimes strange mission encounters, Matt was hooked. Matt is one of hundreds who have benefitted from Oglesby’s leadership. Youth workers who aren’t affiliated with ACU or the Church of Christ know the reputation of the Center for Youth and Family Ministry and call on Oglesby for assistance. It isn’t unusual for him to answer 20 or so emails each morning from youth ministers seeking information. The top request, Oglesby said, is for information on hiring processes. Calls come from churches looking for youth ministers or interns and from youth ministers or students looking for churches with jobs available. The requests for information got to be so numerous that Oglesby put together a 40-page guide for churches that is emailed to them. “It helps them to hire more professionally,” Oglesby said. Another resource offered by the center is an intern placement session in February. From 40 to 50 churches send representatives come to campus to interview students for summer jobs. A change that Oglesby has noticed over the years is in the number of women going into youth and family ministry and the number of churches seeking them out. Traditionally, women have not served in the pulpit at Churches of Christ, but they more and more are serving in other ministry positions. Youth and family ministry is a natural. Oglesby said 30 to 40 percent of the students majoring in that area are women. And placements continue to pick up in churches with openings. “That’s becoming more frequent,” he said. That’s something Oglesby is proud of, and he credits his wife and two daughters with helping to shape that view. Besides answering questions and providing resources as director of the Center for Youth and Family Ministry, Oglesby spends quite a bit of time in the classroom. And that’s another part of his job description that he loves. Getting to know students and watching them develop into Christian servants is very rewarding for Oglesby. “I have some of the best of the best,” he said of his students. He takes his role in their lives seriously, meaning he is more than just their classroom professor. Like his colleagues across campus, Oglesby believes it is important to form relationships with students that can last for a lifetime. Oglesby is grateful that other ACU faculty members think the same way. Both he and his wife, the former Jenny (Linn ’81), are graduates of ACU. He earned a bachelor’s degree in Bible in 1981 and also met his future wife that year. She now teaches Advanced Placement English classes at Cooper High School. The three Oglesby children also bleed purple. The oldest, Lauren (Oglesby ’08) Edwards, is a dentist in Abilene and her husband, Jeffrey, M.D. (’08), practices internal medicine. Son Greg (’11) is associate director of recruiting and financial aid at ACU. His wife, Courtney (Yoder ’11) is a reading specialist at Lee Elementary. Daughter Leslie (’15) works for a software company called Passare in Abilene. With all the family ties to ACU, it’s easy for Oglesby to tout the university. But it’s more than that for him. Other than a Harley or a mountaintop, there aren’t many places Oglesby would rather be than among students and colleagues at ACU. “I’m the luckiest man in the world to get to do what I do,” he said. Tags: Center for Youth and Family Ministry, Robert Oglesby Jr.